Elitism is the belief or attitude that some individuals, who form an elite—a select group of people with a certain ancestry, intrinsic quality or worth, higher intellect, wealth, specialized training or experience, or other distinctive attributes—are those whose influence or authority is greater than that of others; whose views on a matter are to be taken the most seriously or carry the most weight; whose views or actions are most likely to be constructive to society as a whole; or whose extraordinary skills, abilities, or wisdom render them especially fit to govern. Alternatively, the term elitism may be used to describe a situation in which power is concentrated in the hands of a limited number of people. Oppositions of elitism include anti-elitism, egalitarianism, populism and political theory of pluralism. Elite theory is the sociological or political science analysis of elite influence in society—elite theorists regard pluralism as a utopian ideal. Elitism also refers to situations in which an individual assumes special privileges and responsibilities in the hope that this arrangement will benefit humanity or themselves. Elitism is closely related to social class and what sociologists call social stratification. Members of the upper classes are sometimes known as the social elite. The term elitism is also sometimes used to denote situations in which a group of people claiming to possess high abilities or simply an in-group or cadre grant themselves extra privileges at the expense of others. This form of elitism may be described as discrimination. Attributes that identify an elite vary; personal achievement may not be essential. As a term "Elite" usually describes a person or group of people who are members of the uppermost class of society and wealth can contribute to that class determination. Personal attributes commonly purported by elitist theorists to be characteristic of the elite include: rigorous study of, or great accomplishment within, a particular field; a long track record of competence in a demanding field; an extensive history of dedication and effort in service to a specific discipline (e.g., medicine or law) or a high degree of accomplishment, training or wisdom within a given field. Elitists tend to favor systems such as meritocracy, technocracy and plutocracy as opposed to radical democracy, political egalitarianism and populism. 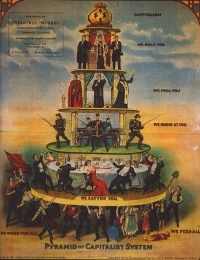 Some synonyms for "elite" might be "upper-class" or "aristocratic," indicating that the individual in question has a relatively large degree of control over a society's means of production. This includes those who gain this position due to socioeconomic means and not personal achievement. However, these terms are misleading when discussing elitism as a political theory, because they are often associated with negative "class" connotations and fail to appreciate a more unbiased exploration of the philosophy. Elitism in the context of education is the practice of concentrating attention on or allocating funding to the best students, or those students who rank highest in a particular field of endeavour. For example, a politician who promotes advanced classes for students deemed to be highly intelligent might be accused of elitism, even if this were argued to promote an egalitarian goal, such as curing disease. Elitism in education could be based on conventional assessment of learning ability, knowledge, or other abilities. However, an "elite" school can also mean a school which is wealthy, or hard to enter. The term elitism, or the title elitist, are sometimes used by people who are (or claim to be) not a member of an elite organization. In politics, the terms are often used to describe people as being out of touch with the Average Joe. The implication is that the alleged elitist person or group thinks they are better than everyone else; and, therefore, put themselves before others. It could be seen as a synonym for snob. An elitist is not always seen as truly elite, but only privileged. The definition may have different appreciations depending of the political contexts. Since elitism may be viewed as something necessary for creating patterns of good intellectual or professional performance, it can be used also for maintaining conditions of lack of competition and privilege. Elitism endorses the exclusion of large numbers of people from positions of privilege or power. Thus, many populists seek the social equality of egalitarianism, populism, socialism, or communism. They may also support affirmative action, social security, luxury taxes, and highly progressive taxes for the wealthiest members of society. All of these measures seek to reduce the difference of power between the elite and the ordinary. Pluralism is the belief that public policy decisions are or should be the result of the struggle of forces exerted directly or indirectly, by large populations (workers, consumers, retirees, parents, etc.). This contrasts with elitism, which is the belief that decisions are, or should be, made essentially according to the ideals of the elites. Unless indicated otherwise, the text in this article is either based on Wikipedia article "Elitism" or another language Wikipedia page thereof used under the terms of the GNU Free Documentation License; or on original research by Jahsonic and friends. See Art and Popular Culture's copyright notice. This page was last modified 19:56, 2 October 2014.